Halloween is loved by both adults and kids with festivities that include decorating homes, wearing costumes, going to parties, and trick-or-treating among others. However, there are also more house fires reported in the few days surrounding Halloween each year because many of the traditional Halloween decorations are also serious fire hazards. The National Fire Protection Association estimates that Halloween decorations start around 900 house fires per year which cause millions of dollars in property damage. With so many people ready to celebrate Halloween in the few days leading up to and including the holiday, it is very important to practice good fire safety to keep the festivities safe. Many traditional Halloween decorations are fire hazards due to flammable materials or the use of candles. The following fire prevention tips will help you safely decorate your home with your favorite Halloween decorations. Jack-o-Lanterns: The jack-o-lantern is one of the most popular images associated with Halloween and often the first decoration that comes to mind. Traditionally, a candle is placed in these carved out pumpkins to light them up. The lit candle is a potential fire hazard, especially if the pumpkin gets tipped over near dry leaves or other flammable decorations. If you leave a jack-o-lantern with a lit candle on your wooden porch, the candle could cause the porch to ignite. Jack-o-lanterns are even more of a fire hazard inside the home as the candle could ignite flooring, draperies, upholstery, and other flammable materials. You should consider using an LED light or electric candle to prevent fires. Candles: People use all types of candles as Halloween decorations from lighting pumpkins to lighting homes and outdoor walkways. Candle light creates the ideal atmosphere for Halloween night, but also a dangerous one. 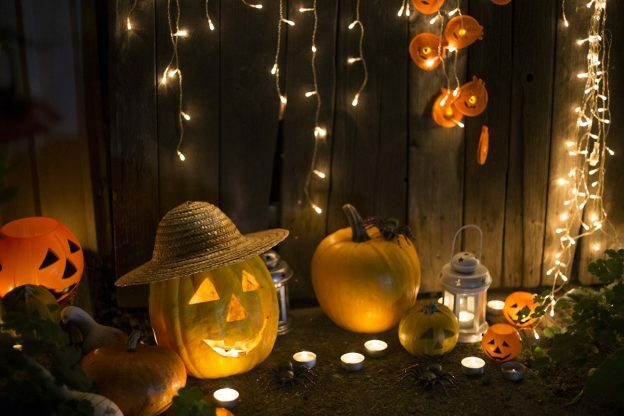 These candles can ignite surrounding decorations if they are knocked over and they can also ignite Halloween costumes if a trick-or-treater walks too close to them. Electric or battery operated candles can create the same type of atmosphere without the fire risk. Flammable Decorations: Many of the common Halloween decorations that do not involve the use of a flame are flammable themselves. Corn stalks, hay bales, and paper decorations must be three feet or more away from decorations with a flame or heat source. Paper Bag Luminaries: These decorations are often used to line driveways and walkways but they are also a very dangerous fire hazard if used with a lit candle. The paper bags can ignite very easily and anything from a trick-or-treater to the wind can knock them over. Use electric candles or LED lights for paper bag luminaries. Use flame retardant materials for your costume. Avoid long trailing or bulky costumes that could catch fire. Review how to “Stop! Drop! And Roll!” with your kids. Give your kids flashlights or glow sticks to light their way at night, do not let them handle lit candles. You can ensure that you and your kids have a fun and safe Halloween by following these fire safety tips. It is very fitting that Halloween falls at the end of Fire Prevention Month as everyone must take extra precautions to help prevent fires for a safe holiday. If you do experience a fire in your home despite your best fire prevention efforts, you must call ServiceMaster NCR right away for fire damage restoration services. We will arrive at your home quickly to limit the damage and start the restoration process.